Secret Training Tip #734 - Building Biceps! This extremely simple bicep exercise that has the potential to put inches on your arms. Learn more about this great training tip for building bigger biceps! What&apos;s the first muscle that you think of when you think of bodybuilding? The biceps! Having big, well-developed biceps marks you as a serious trainer. But what do you do if your biceps lag behind in development? Or if you simply want to build them as large and strong as possible as quickly as possible? I&apos;m going to share with you the secret exercise technique that helped me go from 13 1/2-inch arms to 18-inch arms in my first year of training. And all it takes is one single rep! Most people love to train biceps, flexing their arms with pride at the end of every set, yet not always seeing the kind of results they want to see. This article will tell you how to get the results you want from your biceps training. Let me just start by telling you that, personally, my biceps have always been among my weakest and slowest-to-develop body parts. Some people have the genetics to easily build big, strong biceps. Not me! I&apos;ve had to come up with training techniques to blast past these limitations and have had to fight for every inch on my arms. The point of me telling you this is that I&apos;m not somebody for which just anything will build big biceps. The training techniques have to be really powerful for me to see results. The technique I&apos;m about to share with you works the biceps so thoroughly and so powerfully, your biceps will have no choice but to get bigger and stronger. The fact is, this technique is so simple as to be downright elegant in its simplicity. What is this exercise? It&apos;s the Flexed Arm Hang. The Flexed Arm Hang is not complex, but it provides you with a number of very powerful benefits that make it an ideal exercise for piling muscle mass on the biceps. To fully understand the benefits of the exercise, you must first learn how to do it to properly focus on the biceps. Grasp a chin-up bar with a palms-facing-you grip. Your hands should be about 6 inches apart on the bar. You want to keep them fairly close together to maximize the tension on the biceps. Next, you will need to get yourself into the top position of a chin-up. You can do this by standing on a bench or pulling yourself up into position. My preference is to start by standing on a bench. This allows you to get set up very precisely and deliberately. For body position to maximize bicep work, you will want to have your eyes level with the bar, with your face very close to the bar (almost touching it, in fact). Keep your body as vertical as possible and try not to let your body lean backwards. 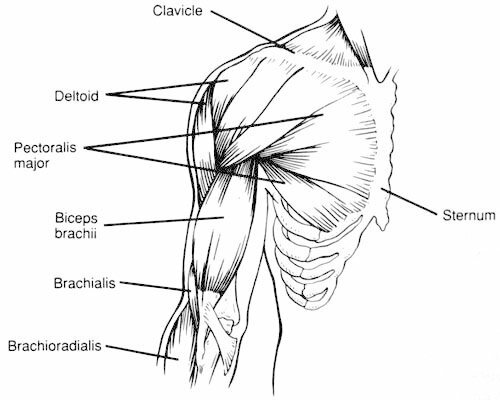 The more vertical you stay, the more tension will go onto the biceps rather than the back. Now comes the work... hold that position for as long as you can! Contract your biceps hard and hold that position until your biceps start to weaken. Now fight gravity all the way down. Don&apos;t let your body drop quickly but try your very best to hold your position as gravity pulls you down. Even when you&apos;re almost at the very bottom with your arms almost straight, still try your best to keep holding. Go until you can&apos;t even hang onto the bar anymore! That&apos;s the exercise. Not too complicated! If you&apos;re familiar with X-Rep or Static Contraction training, this concept is essentially the same... hold the contracted position of an exercise for as long as possible! Holding the contracted position of this exercise for as long as you can recruits almost every available muscle fiber in the biceps. It&apos;s an emergency situation to the body and it will fire every fiber it can. The fully-contracted position engages the most muscle fibers. This article will deal mainly with how people think the muscle type makes no difference, how muscle type is over-rated and how it gets more credit then it deserves. 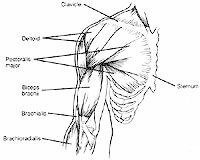 This exercise places continuous tension on the biceps for the entire duration of the exercise. Continuous high-level tension will work wonders on your biceps. 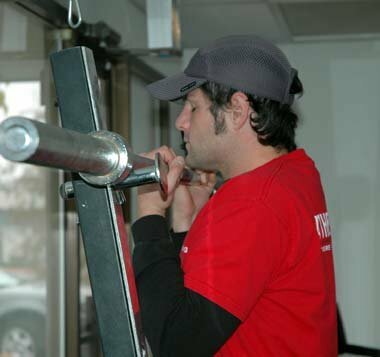 The exercise uses your bodyweight and moves your body around the resistance on the way down (like a chin-up) rather than the resistance around your body (like a barbell curl). Exercises that move your body have been shown to activate more muscle fibers than exercises that move the resistance. The highly intense, multiple-muscle nature of this exercise stimulates far more growth in the biceps than exercises that work the biceps in isolation (which most bicep exercises do, even the gold standard barbell curl). It requires almost no equipment and can basically be done anywhere you can grip on and hang from. If you combine all five of these powerful benefits, you have an exercise that stimulates the maximum number of muscle fibers, with continuous tension, using a compound exercise that moves your bodyweight, and requires very minimal equipment. Bigger Biceps For Beginners - The Smart Way To Train Your Biceps. So how do you take full advantage of this extremely powerful biceps-building exercise? Finish every workout with one single rep of the Flexed Arm Hang. One rep is all you need as that one rep will work the majority of your bicep muscle fibers. You can also add resistance by holding a dumbbell in between your feet or by using weighted dip belt. The potential gains in size and strength are tremendous! If you make a habit to do one single intense rep of this technique at the end of each and every workout, I guarantee you will see excellent bicep growth and development. When you&apos;ve done one good rep of this exercise, you&apos;ll know you&apos;ve squeezed out every last drop of bicep growth from your body!